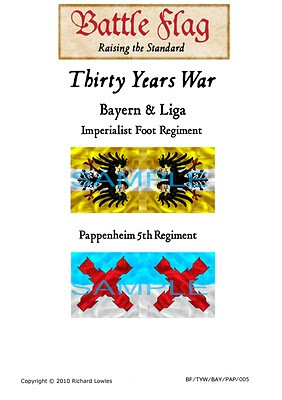 Having had a number of requests to create 25mm flags of the Thirty Years War period, I decided to turn my attention to the Bayern and Liga Regiments of Gottfried Heinrich Graf zu Pappenheim. 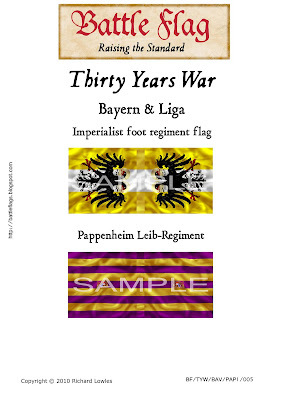 I intend to create a large number of flags in this particular range so do keep dropping back to the blog and checking for more updates and pics. The range of Thirty Years War flags from Battle Flag will as always be historically accurate, and offer war gamers and model soldier collectors the very best quality and selection in 25mm Regimental flags and Standards. 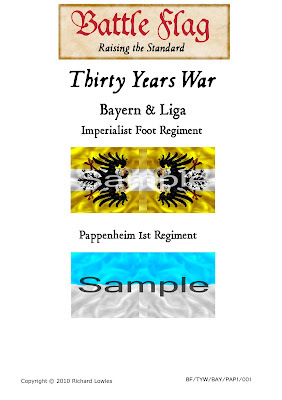 Dont forget to check out the Tutorial to ensure that you get the best from your war game flags and standards. Thanks! Glad you like the work chaps.